Musicians, audiophiles, and music lovers, we’re here to present you with some of the best studio headphones in the market today. 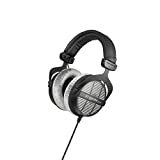 Since it’s kind of obvious that they are used for studio work, what makes them better suited than other headphones? It’s quite simple – they provide better signal reception, and offer flat response which makes them suitable for both recording tracks and mixing. We’re opening up our review with Sony’s MDR7506. This model features neodymium magnets, as well as powerful 40mm drivers that provide vividly detailed and accurate sound. The closed-ear design allows for absolute comfort while wearing them, but it also contributes to the reduction of ambient noises. This is a corded headphone model which comes with a non-detachable 9,8-foot cord. You can, however, fold these up for easy storage, and you’ll even get a complementary soft case as a bonus feature. Sony’s MDR7506 features a large diaphragm and boasts a rugged, very durable construction. We were bought by the beautiful, yet sturdy design. These headphones look expensive but come at an affordable price, and what’s more – they offer premium-quality studio level sound. The ambient noise reduction is beyond average while the overall feature configuration is top notch. Even though this is not a fatal flaw per se, most people like cordless studio headphones, and this model is “wired”. Apart from that, there’s nothing we would like to see improved, as the overall performance is impeccable. Great sound, stunning looks, and awesome durability – yep, if you’re looking for the best best studio headphones under 100, you’ve found them. They are well worth the cash, and that’s a major understatement. Next up on the menu is ATH-M50x. They come available in five color variations, including black, blue, red, white, and gun metal, and come outfitted with bleeding edge technology. It’s only natural that this model is favoured among audiophiles since it comes from the leader in the industry (Audio Technica), and what makes it so good are the 45mm drivers, the copper-aluminium wire coils, and the circular design. The earcups can swivel up to 90-degrees while the earpads, as well as the headband are made of incredibly soft, yet rugged materials. Excellent comfortability, outstanding audio quality, and professional-grade features were the first to catch our eyes. These headphones look amazing, they will last you for years, if not decades, and it’s safe to say that they’re among the best studio headphones under $200. People point out that they are not so well suited for rock and metal music fans. The lows and mids are pretty great, but the high frequencies appear to be a bit too harsh. Maybe not the best, but they are a very good studio headphones for the price. They offer premium-quality sound and an outstanding level of comfort, but the high frequencies they emit just won’t appeal to everyone. Sennheiser makes some of the finest electronics on the market, and we’ve taken a gander at HD280Pro, which appears to be one of their finest works. These headphones feature a closed-ear design and are as lightweight as they are comfortable. The ergonomic qualities are provided by ultra-comfortable light pads, but what makes them so good is the unparalleled ambient noise reduction (will negate up to thirty two decibels of ambient noise). 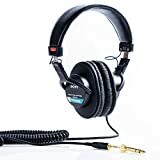 The frequency response of these headphones is superior in comparison to average models, and its durability ensures that you’ll be able to use it for years to come. 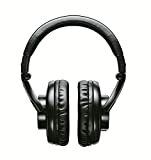 Apart from the stunning outlook, they provide high-fidelity sound. We really liked how light these headphones are and immediately assumed that they’re flimsy, but our initial presumption was wrong – these headphones are as hard as a rock. Even though they are comfortable, they appear to be a bit bulky around the headband area. Apart from that, everything’s quite great. HD280Pro is one of the finest cheap headphones you’ll find anywhere. You can look up on Amazon, Best Buy, Walmart, or even John Lewis, but we guarantee that you won’t find a better deal for the buck. Now, Beyerdynamic might not be as famous as Audio Technica, Sony, or Sennheiser, but we’ve decided to introduce this model for the sake of diversity. 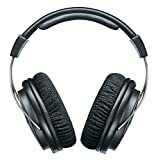 These headphones feature an open over-ear design, and they were, as the brand states, specifically tailored for mixing and editing. They provide transparent bass and excellent frequency response, the entire soundstage is well-rounded and balanced while the hard-wearing robust craftsmanship ensures longevity, to say the very least. Amazing sound quality, exceptionally convenient open over-ear design, and excellent soundstage – these would be the words that would best describe how we felt about them. Just like HD280Pro, DT990 Pro is a bit bulky in the headband compartment. They’re, however, smaller in design when compared to the former. People seldom trust underdog brands, but we implore you to think otherwise this time. DT990 Pro are one of the best sounding headphones for the price, even though they don’t come from one of the leaders in the industry. If you need high-quality electronics at an approachable price, you go to Shure. These guys have graced the market with a plethora of exquisite tech pieces, and we’re reviewing their studio headphones today. Shure’s SRH440 feature a closed-back collapsible design, they come with a detachable cable, and feature a convenient little bayoned clip which will securely lock the cable into the ear cup. You’ll get a 0,25-inch adapter, a carry back, and the user’s guide as complementary features. The design is innovative and exquisite, the quality of sound is beyond great, and you’ll get plenty of goodies as bonus features – what’s more to like? These are a bit heavier than most models we’ve reviewed so far. Even though this is not a fatal flaw, you might want to be prepared for some fatigue if you intend to use them for more than several hours. Shure is yet to disappoint our fellow audiophiles, and we daresay that SRH440 stands for one of the best cheap studio headphones. It’s true that they are a bit heavier than average, but the quality of sound and all-around performance are more than enough to make up for this little downfall. HD 650 are high-end professional grade headphones outfitted with bleeding-edge technology. They come supplied with special silk layers which dampen the outside noise – this comes in handy knowing that they’re open-back headphones. In comparison to previous Sennheiser models, this one has an improved range of frequency response, spanning from 10 to 39,500 hertz. They also feature lightweight voice coils made of aluminium and high-power magnets for optimum performance. One thing that’s awesome about HD 650 is that they’re equally good for mixing and recording. The open back design means some of the sound will eventually leak out, but the specially designed silk layers make sure that’s kept to a bare minimum. On top of that, the enhanced frequency response is always welcome. Although it’s quite obvious that HD 650 is superior in comparison to earlier Sennheiser models in terms of performance, the aesthetic part is pretty unchanged. A more important matter is that the metal parts don’t really mold well to the wearer’s head. The 650 might not be a good example of a budget headphone set, but we can guarantee that it’s well worth the money. Excellent performance, fatigue-free experience, and a broad frequency response range are but some of the things that you’ll grow to love about these headphones. Dre’s Beats are one of the most famous brands in the headphone industry. The Studio3 packs adaptive noise-cancelling technology, they sport a closed-back design, real time audio calibration feature, and a huge battery lifespan (up to 22 hours on a single charge). They’re also wireless and pack a Fast Fuel feature which allow you to zap the battery back to life in mere 10 minutes, providing you with 3 additional hours of playtime. On a side note, these headphones are available in nine colour variations and look absolutely phenomenal. Even though Studio3 has it all, we liked ANC and Fast Fuel features the most. Namely, the former actively blocks all external noise while the latter provides the user with ability to enjoy in music for longer (not that 22 hours is a small time period, in truth). The only issue with Studio3 is the headband, according to most people. Namely, the sound is great, and they’re very comfortable to wear, but the headband simply lacks any cushioning whatsoever, making it a bit hard on the wearer after a couple of hours. The aesthetics, performance, long battery lifetime, and bleeding-edge technologies. These are the all the things that made us not only think, but be certain that Beats Studio3 are among the finest studio headphones ever built. SRH1540 is a closed back headphone set equipped with 40mm drivers that provide a well rounded soundstage – the bass is very deep, mids are bright and crispy while the highs are as warm as can be. The sheer construction of these headphones is pretty lightweight, featuring aircraft grade aluminium materials and carbon fibre cap for additional durability. Overall, it’s a simple headphone set outfitted with high-quality features that promise a lot in terms of versatility and performance. First of all, they’re tough as nails while still being extremely comfortable to wear. To top it all, they’re lightweight, so you can wave head fatigue goodbye. Its performance, however, is what makes it so valuable for the money. The only bad thing about these headphones is the clamping pressure – the cups tend to dig in the ears after a while, which might (or might not) feel a bit uncomfortable to some people after a couple of weeks. Shure’s among the most popular brands in this department, and SRH1540 is certainly a good representative of their quality. This headphone set stands for premium all-around headphones, so if you have the buck, don’t miss out. Here we’re looking at yet another fine model from Shure, the SRH1840 which, unlike the previous model, are open back studio headphones. Essentially, SRH1840 and SRH1540 come supplied with a similar set of features, although there are a couple of differences worth mentioning. They’re both made of aircraft-grade aluminium materials and feature 40mm neodymium drivers, but this one has a different design which makes it better for recording tracks (whereas SRH1540 is perfect for mixing). Take all the benefits SRH1540 provides and add ‘good for casual listening’ on the list and you’ll have SRH1840. These are versatile headphones that are held in high regard by music engineers and audiophiles alike. In all fairness, closed-back headphones are just slightly better for studio work, so if that’s your primary concern, we suggest you pick SRH1540 instead of this model. If you’re looking for a more versatile approach (especially if you intend to use them to actually enjoy in your music), the SRH1840 is a perfect choice. The big guys at Shure just can’t make a bad headphone set, but even so, they’ve outdone themselves with the SRH1840’s. They’re absolutely great for the money, and then some, so if you’re on the market for quality, you know you want these. Last on our list is a big hitter – the DT 1990 Pro. These headphones feature 45mm Tesla drivers that provide unparalleled performance, ultra-soft headband and cups, and pack a well-rounded soundstage. The brand also pitched in a couple of complementary features, including two pads with completely different audio characteristics, two sets of cables, and a hard carry case. The sound quality of these is simply above everything within the price range. To top it off, they’re specifically designed for studio work and come with both analytical and balanced replaceable ear pads, making them pretty much the most versatile headphones we’ve covered so far. Frankly, the only thing that could be improved is the price, as they, metaphorically speaking, cost an arm and a leg. Though they’re rather expensive, DT 1990 Pro have it all. They’re powerful, sleek, pack a huge punch for the buck, and come with gratis goodies. What’s more to like? There are brands that never fail to deliver the promise of quality – such is the case with Sennheiser, Shure, Audio Technica, and such. Here we had an opportunity to see that even underdog brands can shine, such is the case with Beyerdynamics. Studio headphones usually cost quite a lot, and in fact, in most cases you’ll have to pay over $200 to get a boutique level option. After hours of research we’ve managed to dig up several models that come from prominent leaders in the industry and don’t cost too much – we hope that you liked our selection of the best studio headphones, and we wish you all the luck with your studio rehearsals/recording sessions!